French rabbi and scholar; born at Paris July 7, 1856. He was ordained as rabbi by the Rabbinical Seminary of Paris in 1879; appointed assistant rabbi to the chief rabbi of Paris in 1882; professor of Jewish history and literature at the Paris Seminary in 1892; lecturer on Talmudic and rabbinic literature at the Ecole Pratique des Hautes Etudes in 1896. During 1894-95 Lévi was director of "Univers Israélite." He is one of the leading spirits of the Société des Etudes Juives. On its organization in 1880 he was elected secretary and general manager of the "Revue des Etudes Juives," and in 1892 took charge of its bibliographical section. He has contributed to this journal papers on the Haggadah, the Talmudic and midrashic legends, Jewish folk-lore, the religious controversies between Jews and Christians, as well as on the history of the Jews in France. 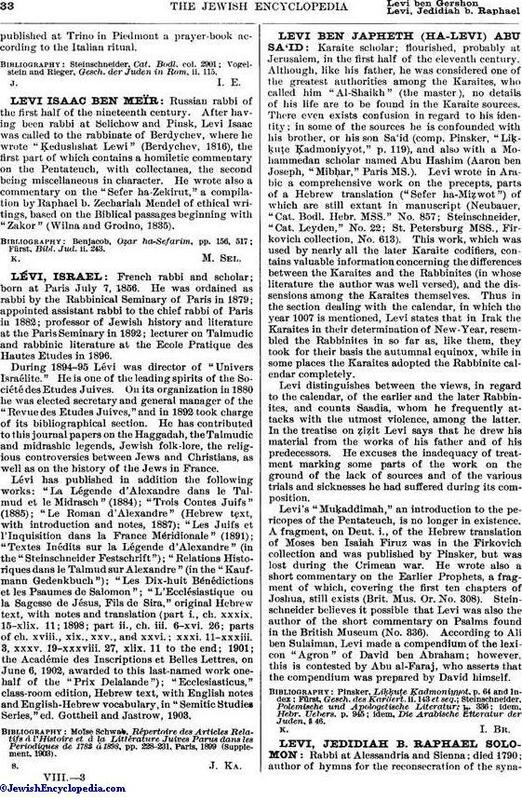 Lévi has published in addition the following works: "La Légende d'Alexandre dans le Talmud et le Midrasch" (1884); "Trois Contes Juifs" (1885); "Le Roman d'Alexandre" (Hebrew text, with introduction and notes, 1887); "Les Juifs et l'Inquisition dans la France Méridionale" (1891); "Textes Inédits sur la Légende d'Alexandre" (in the "Steinschneider Festschrift"); "Relations Historiques dans le Talmud sur Alexandre" (in the "Kaufmann Gedenkbuch"); "Les Dix-huit Bénédictions et les Psaumes de Salomon"; "L'Ecclésiastique ou la Sagesse de Jésus, Fils de Sira," original Hebrew text, with notes and translation (part i., ch. xxxix. 15-xlix. 11; 1898; part ii., ch. iii. 6-xvi. 26; parts of ch. xviii., xix., xxv., and xxvi. ; xxxi. 11-xxxiii. 3, xxxv. 19-xxxviii. 27, xlix. 11 to the end; 1901; the Académie des Inscriptions et Belles Lettres, on June 6, 1902, awarded to this last-named work one-half of the "Prix Delalande"); "Ecclesiasticus," class-room edition, Hebrew text, with English notes and English-Hebrew vocabulary, in "Semitic Studies Series," ed. Gottheil and Jastrow, 1903. Moïse Schwab, Répertoire des Articles Relatifs à l'Histoire et à la Littérature Juives Parus dans les Periodiques de 1783 à 1898, pp. 228-231, Paris, 1899 (Supplement, 1903).